On March 27,2007 Mark Funkhouser was elected Mayor of Kansas City, Missouri, by the narrowest of margins. A chess afficionado, Funkhouser watched the election results come in at the Westport Chess Club! Mark had less money for PR than most of the candidates, even going without a campaign manager. He focused his efforts on the cheapest medium, the web. On his user-friendly site, www.markfunkhouser.com, he put up a famous commercial with his dog that the local media picked up on. Here is his my space page, designed in his campaign's signature color, orange. Mark is an avid chess player and a big advocate of chess and its benefits. Mark regularly attends a local chess club in Kansas City, the Westport Chess Club. Tim Steiner, a local Expert and founder of midwestchess.com sits down with Mark Funkhouser to talk about politics, chess and everything in between. It was a slow night and I didn't know Mark Funkhouser very well so I challenged him to a game. I'd seen Mark many times down at the club but I had never played him before. I was able to get an advantage early, but Mark kept fighting and before long he was in an equal position. Soon after, Mark was able to whip up a vicious attack against me. I was obviously asleep at the wheel. I thought Mark's rating was around 1200, so I tried to match his rating. About half way through I felt strange. This guy was no 1200. This guy played like a 1500. During the interview I found out that Mark had actually been to the 1500 level. I met Mark after one of my young female students pulled off a difficult but very pretty combination to force a draw with him. Mark immediately wanted to know how this happened and my student chimed back that she had an instructor. "Oh really", I could hear Mark saying as if he was surprised. And that's when I met Mark. Funkhouser was very gracious with my student (900 USCF) and complimented my coaching. Many club members were excited to speak with Mark, who is gregaroious and charismatic. He is the closest thing our club has to a celebrity (besides our resident International Master Michael Brooks). I once observed Mark talking to several chessplayers about problems in the city government and how to address them. I found it incredibly refreshing to meet a public servant who didn't provide canned response and who was open to discussing politics with the any common citizen. How many of you have found it this easy to approach your city officials, your state's Congress and House members, or your state's Governor? When I found out that Mark was going to run for Mayor, I was shocked. I thought I had Funkhouser figured out I thought for sure that Mark had his fill after years of city officials chiding him for doing his job well. So I took the opportunity to find out a little more about the man they call "Funk." Tim Steiner (TS)- When did you first learn the game of chess? Mark Funkhouser (MF)- Ohh, I can't remember, I must have been 17-18 years old. My brothers taught me. TS-What do you like most about the club? MF- A good group of folks, beer, cheeseburgers, 2 for 1. I like it because it has all different ages and all different qualities of play. TS-What rating would satisfy you? MF-1200, I don't care, I don't care what my rating is. TS-During 2005, I see that your rating jumped up a few hundred points. How did that happen? MF- You know we went to Des Moines, to a big tournament and I played extremely well and I have no idea why. The thing about it… I'm 57 years old, and I was decent like 30 years ago, so like every once in a while a little synapse falls together and I remember how to play, (chuckling). TS- Do you ever take time to study? TS-Looks like you play mostly in events down at your club. Have you wanted to be a more active player or play in other local tournaments? TS-Your children play chess at the club. Have you tried to instill the value of chess in their lives? MF- Oh yeah. I want them to play chess. I think chess is like…I'm a believer. I think it's a great game for kids…the mental discipline…analysis… You know, it beats the hell out of video games. TS-You had your run-off election night watch party at the Westport Flea Market, where the Westport Chess Club meets. Why? MF-Well Tuesdays are election days. Well, yeah, I chose to be here, yeah. We liked it, it was a comfortable place, so we were gonna do it here. For a brief time, The Westport Chess Club met at Pizzeria Uno's because the Westport Flea Market was rumored to be sold to Hooter's. This never happened, so the club moved back. TS-You have many choices when it comes to your free time and hobbies. Why did you choose chess? Or did chess choose you? MF- I have played it since I was 17 or 18…you can play it forever, you know, there's no equipment to speak of…all you need is a chessboard. It's the only hobby I have. It's the only fun thing that I do. TS- An article in the Kansas City Star from March 25,2007 just two days before Mark was elected, said that you don't (or didn't) put much planning and strategy into your life, yet you've been successful. Most strong chess players would argue that a majority of chess is raw calculation and sound orthodox play. Then there's the group that says that chess should be played with more intuition or instinct. It sounds like you subscribe to the latter. Which is more important: calculation or instinct as it applies to life? MF- I think instincts count for a lot. I would actually talk about chess metaphorically, I'm not that disciplined, but certain moves are sort of sound positional moves and developmental moves and that's how I've run my life. You know I did not grow up planning to be an auditor for example but getting more education was a sound positional move. You know I've got 4 college degrees... it was the most logical move, but not with some clear strategy… I did not know when I'm 57 I'm gonna be Mayor of Kansas City…that was not the plan. TS-Did you view your entire campaign as one big, long chess game? Could you draw some parallels for me? MF-Oh yeah, through my own thinking there are lots of parallels. For example the way I played the campaign was positionally…we adapted…quickly…then we realized… we learned quickly…and I said initially…and people were telling me that I was going to need hundreds of thousands of dollars and I thought I would be really conservative and careful so I said I'm gonna raise $150,000 for the primary and within a couple of days I realized that was absurd…I couldnt remotely raise that kind of money…and so I made adjustments. Now other people hired a campaign manager…I did not hire a campaign manager. At the end of the first financial filing, I was dead last in money. So the newspapers and the pundits…they all told me… "well, you're gonna quit, right"Well no (laughing) I'm not. So we had to adapt and we did stuff with the web, simply because it was free (laughing). All my brothers play chess better than I do. I've got one brother that's like 2150…he's been the West Virginia chess champion now like 8-9 times. One of my brothers has this saying: …Don't put your pieces in the center until they'll stay there." So when I declared for Mayor everybody thought it was some kind of ploy. If I didn't think I could win, I wouldn't have placed my pieces there.I wouldn't have quit my job if I hadn't counted or calculated that I could win. TS-Most people say that math and chess have strong ties. You have a math background. Do you think that math has helped your chess game? Do you think that chess has improved your auditing abilities? MF- You know I think logical analysis which is sometimes math, you know I hope they help my chess game…but I believe in different facts and data...you gotta look at the position on the board. Sure in the sense that it's about logic and analysis…absolutely. TS-You've been accused in the media of being too outspoken and that the degree of your honesty is a handicap for you... that your aggressiveness in purporting the truth should land you in political ruination. Would it surprise you to learn that ex-World Champ Garry Kasparov has on numerous occasions cited that skilled risk taking and bravery over the chess board are essential to top level chess? That you must risk losing in order to win? Many players essentially boil down chess as the ultimate search for truth. Do these parallels ring true with you? Comments? MF- I've found that in my own play, for years, particularly when I was playing better, the more aggressively I played the better my results. The more carefully I played…the more conservatively I played the more likely I am to lose. Whenever I would win an exceptional game, like in Des Moines…I actually beat several players rated several hundred points higher than me, it came from absolute naked aggression. I guess one the reasons my rating isn't very good any more is because I blunder…if I don't make really stupid mistakes and I'm just absolutely aggressive… and you catch them on their heals early…and I know when I'm playing a really good player, that if I let him off the ropes for a second…he'll beat me… you know because he's better…but if I catch him off-guard and I basically slit his throat I guess (laughing)…so I would find I actually kept track in the notation…if I won a game, I won it within 24 …if the game went 30,40 ..50 moves…certainly way into it…I'm gonna lose…particularly late endgame; I could never really handle a real endgame… when I was in one. TS-Does it surprise you to learn that Kasparov is using his influence and celebrity status as a tool to help the common people of Russia, not to mention risking his own life. TS-Is this noble or is this stupid? TS-Over the past 6 years I have been very active in the chess community especially with scholastics. To all those parents and children who are considering taking a dive into chess as a worthwhile activity, what would you say to them? How would chess enhance their lives? MF- Aside from the pure entertainment and fun…the camaraderie of hanging out with folks…there are lots of interesting smart people playing chess…but for children, it's everything that you want...there are lots of studies that show that children who play chess are better students. TS-Over this same time period I have tried to promote chess at the scholastic level. The game suffers from major PR problems. Chess is perceived by youth as geeky or nerdy and the public school systems do not recognize the educational benefits of chess. You were the candidate that nobody gave a ghost of chance for wining the election. You had some of the least campaigning funds and most of the other primary candidates endorsed your opponent. How did you win against all that perceived negativism and overcome the PR issues? TS-Was that one of the biggest advantages you had? TS-You seem to be able to shape public policy and opinion--how would you go about correcting the promotion of chess to children? MF-There are really good teachers and advocates for chess. I think through the park systems--school systems...I can encourage. You know I've already been encouraged to encourage…I've had people from the African-American community for example you should do this, you know…and it's low cost…I think it will not be difficult to do that …I think the image of chess isn't as bad as people think it is. TS-Scholastic chess has grown over the years but there are still major areas where it hasn't taken hold yet, for example, Kansas City. I know some of the reasons why it hasn't but do you think there could be some type of state or city level form of involvement to help scholastic chess flourish? Do you see some sort of initiative being launched for your city as has been launched in other major cities across the US? MF- Oh yeah, I think we could do it here…and you know one of the equalizing things about chess right now…I mentioned to my brother that plays well….we both went to a tiny college in Pennsylvania called Thiel College and when we were there Thiel won the Pan-Am games…you know beating schools…Stanford…Harvard…we had a really gifted teacher…a Russian emigrant named Ivan Romanenko…and we could win…and there's no reason why we couldn't compete with the best players in the country. TS-Were you aware that a large national scholastic event was held in Kansas City last weekend? MF- I only found out about it as it was happening, and I don't understand why it wasn't promoted more. TS- Did you know it set an attendance record? TS-Did you know that almost a quarter of all the participants were from either Kansas or Missouri? MF- NO. NO. I don't know why that wasn't widely known…why the visitors and convention centers hadn't made that known. 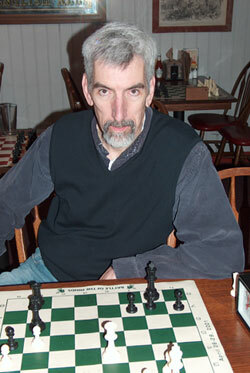 Coach Tim Steiner with The Pembroke Hill School Chess Club. The Pembroke Hill School students with USCF Scholastic Director, Jerry Nash. TS-Do you see these kids as representatives of the city? TS-What if a group of them came back with a team trophy for a high placing? MF-Then the Mayor might welcome them home somehow. TS-Not a lot of people knew about the National HS event here last weekend. The local media outlets didn't seem to cover it at all. No write-ups, no pictures except one in the Local section. Webkins was apparently more newsworthy of exposure on the front page. Given your experience with the media, do you sense the media reflects the beat of the city or do you feel special interest groups or political factions mostly drive it? MF- Well it is not special interest groups or political factions, it's the focus group of the day. We could fix that. We could get chess in there. TS-Do you think it's a shame the media didn't do a better job of reporting on this intellectual activity? MF- Oh my God yes, YES. Here's a parallel story. .. I also happen to like bagpipe music…there has been an event called Winter Storm which is one of the biggest bagpipe events in the world…world champions are competing…and its right here in KC, MO… every year….and it got no press at all. But next year, the Mayor's going to welcome them to town…and by God we are gonna get some press. TS-Do you think that large institutions like public school systems and media outlets place too much emphasis on athletics and social endeavors rather than promoting intellectual pursuits like National Merit Finalists, or spelling bee champs or geography bee or even chess? MF- Because there's money I guess in football and basketball…I've never understood why really good chess players aren't as well known as a really good football player…and I've played… I was a jock… I played all kinds of sports. TS-Which is your favorite chess piece? TS-Who is your favorite player, local, national or international? TS-I once read a study that said tall people do well in all walks of life, especially with public elections and job interviews (for the record Mark is 6'8"). There are psychological reasons for this of course. The article said that the height issue was related to trust; that people instinctively had confidence and trust in taller than normal individuals. Is there any truth to this? Do you think your height helped you win the election? MF-It has been as a young person up until a teenager, it was a real disadvantage to be tall…socially it was really bad…but from 20-something on it's been a real advantage…and of course in the election…aside from the psychological reasons…you want to stand out from the crowd it helps if you're a foot and a half taller. TS-Do you think your height intimidates other people when you play those chess? MF- NO. The average 9 year old that beats me is not intimidated by my height. TS-Can you dunk a basketball on a regulation goal? TS-You've been fairly vocal with the media about your passion for chess. Do you think they take your seriously or are they just patronizing you when they ask chess related questions? MF-Oh I think they take it seriously…I think they are fascinated by it…you know I'm supposed to be a dumb geek…to them…it's an interesting conundrum. TS-Most scholastic players growing up take a lot of heat for being chess players because it's not perceived as being cool. What would you recommend to these kids? MF- I don't know…being good at something is… well good…well don't talk to those people…talk to other people…they are obviously…well… jealous. TS-Besides being a man of great character, much like Abe Lincoln, do you perhaps see yourself as a role model for chess give that you have now increased your public visibility? MF- I hope that good players are role models for chess (laughing)…I believe in the benefits of chess…and if I can use my position to push that ahead, I'm going to. This article was provided courtesy of the Kansas City Scholastic Chess Association (www.kcchess.org).